In its 40 years, the Angel Tree program, an outreach of the Salvation Army, has helped provide gifts to thousands of children who otherwise may not have received any. With toys and gifts provided by the community, it is a truly unique program because it allows people to give gifts to those in their own backyard. This non-profit organization provides basic necessities, such as clothing, to those in need throughout the year. 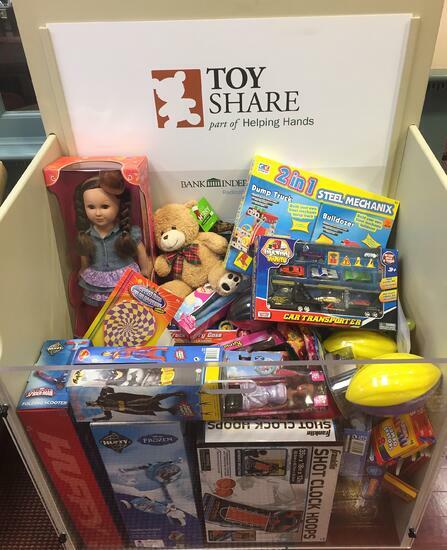 During Christmastime, it also supplies toys and meals to those in the community at no cost to them. Started in 1949 after a boll weevil infestation destroyed the crops in Madison County, local civic leaders saw the huge strain this placed on the farmers in the community, so they started a program to supply donated children’s clothing so the children could start school with the things they needed. That Christmas, toys were donated as well. Thus, Christmas Charities Year Round of Madison County was born! The CCC is a nonprofit organization helping those in need of food, shelter, medical care, and, during the holiday season, Christmas toys for those who otherwise couldn’t afford them. 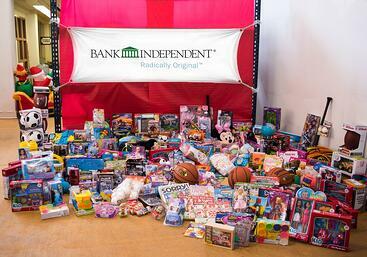 Cornerstone, a nondenominational and spirit-filled church located just a few miles north of Moulton, has partnered with Bank Independent in past Toy Share drives to help collect more and more toys for Lawrence County families. The Department of Human Resources was created in 1935 to administer to the assistance programs that were part of the Social Security Act. These programs were developed to help an American public that was suffering through the financial hardships of the Great Depression, and today still serve thousands of families in need in counties across Alabama. Among the many services provided by our local DHR teams are family assistance programs, which include making the holidays brighter by providing toys for the many children who are registered in the program. The North Alabama Christian Children's Home (formerly known as the Lauderdale County Christian Children's Home) is a 501(c)3 group home that provides 24/7 care for up to 22 children at a time, offering a safe haven for children ages 6 to 17 who have come to them from negative environments. As a faith-based group home, the organization strives to help children feel secure, safe and like part of a family, which includes providing toys and gifts on Christmas morning. The hardworking heroes of the Rogersville Volunteer Fire Department seem always to be involved in the community they serve and protect. From fish fries to saving lives, the firefighters live to give back, and the holiday season is definitely no different. Bank Independent is proud to partner with these guys (and gals!) 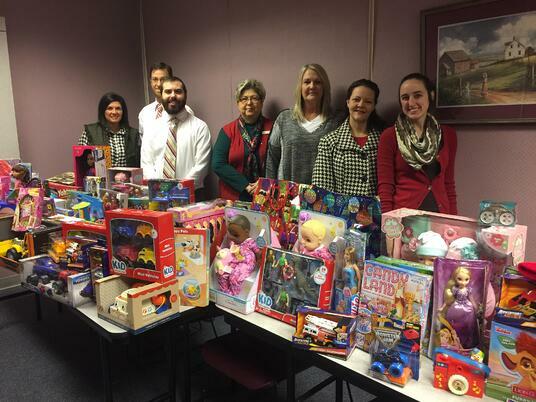 to collect toys to make Christmas morning even merrier for Rogersville area children. Since it was opened in 1981, Safeplace Inc. has been providing shelter, counseling, and outreach programs for families dealing with domestic violence. The mission of Safeplace is to live in a world where domestic violence does not exist. Your toy donations will go to help children in these tough situations have the best Christmas ever! What’s so unique about the William Porter Foundation is that the toys received through donations are set up and arranged into their own little Christmas toy store! Children and their parents are able to “shop” the toy store for their gifts. This helps create a feeling of excitement and anticipation that makes the giving season something truly special. The late William Porter inspired his wife and daughters to create the organization to continue his spirit of giving and helping those in need even after his passing. Any donation received at our branches before December 15th will go to the wonderful and deserving organizations listed and described above. We look forward to seeing you soon, and from all of us at Bank Independent, Merry Christmas and Happy Holidays!